The post-Pearl Harbor raid shakeup of the Pacific Fleet's leadership, begun on 17 December 1941 when Secretary of the Navy Frank Knox relieved Admiral Husband E. Kimmel and temporarily replaced him with Vice Admiral William S. Pye, was completed on the last day of the year. 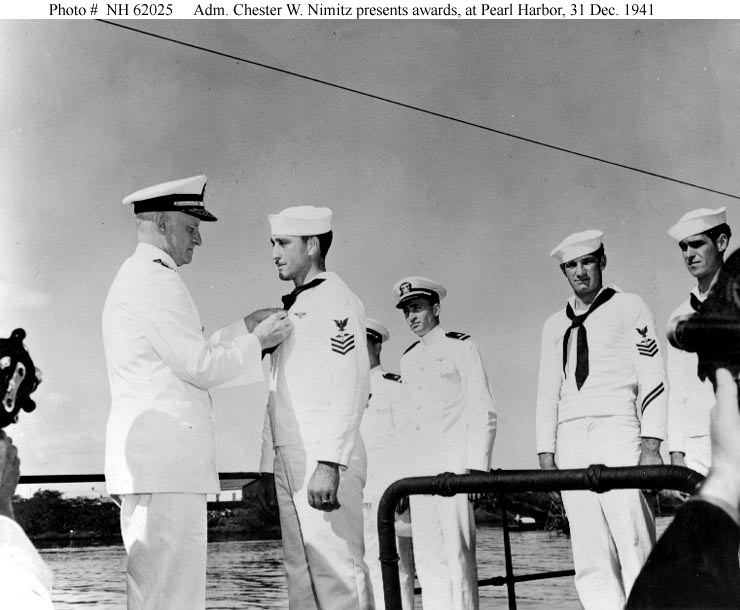 On the morning of 31 December, in ceremonies on board USS Grayling (SS-209) at Pearl Harbor Submarine Base, Admiral Chester W. Nimitz took over command of the Pacific Fleet from Pye and awarded medals to veterans of early combat. Admiral Nimitz, who had arrived at Pearl Harbor on Christmas day after a seven-day train and aircraft trip from Washington, D.C., had spent another six days in conferences and briefings on the dismal war situation and sobering condition of his new command. One of Nature's gentlemen, Nimitz had sympathethically told the disheartened Admiral Kimmel that "The same thing could have happened to anyone". After the change of command ceremony, Nimitz lifted the spirits of the Fleet's existing staff members by expressing his full confidence in them and retaining them all to maintain continuity during what were certain to be very difficult times ahead. At the Submarine Base immediately following the ceremony aboard Grayling, Nimitz had briefly addressed a gathering of senior officers, including his immediate predecessors. Stating that "We have taken a tremendous wallop ... but I have no doubt of the ultimate outcome", he summarized his immediate plans to "Bide your time, keep your powder dry, and take advantage of the opportunity when it's offered." That statement, intended for public consumption and therefore deliberately ambiguous, was nevertheless a reasonably accurate indication of the U.S. Navy's strategy for the Pacific War's next few months, a time to be spent hurting the enemy where possible while rebuilding strength and confidence for an inevitably very long struggle. This page features views related to the CincPac change of command ceremonies on 31 December 1941. Presenting awards on board USS Grayling (SS-209), at the Pearl Harbor Submarine Base, following ceremonies in which he took command of the U.S. Pacific Fleet, 31 December 1941. 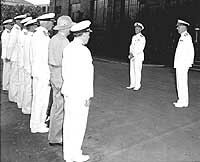 The former fleet commander, Rear Admiral Husband E. Kimmel is standing to the right, in a white uniform with two-star insignia. 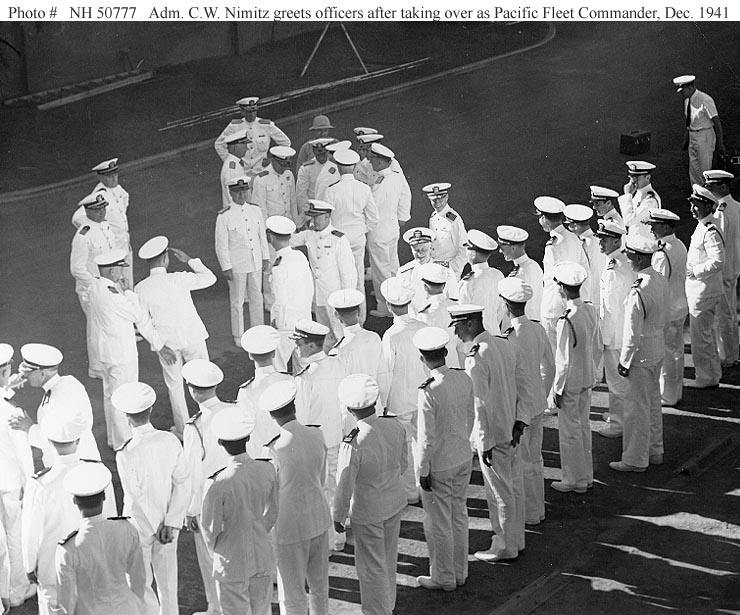 Admiral Nimitz has just presented the Navy Cross to Ensign F.M. Fisler, USNR. 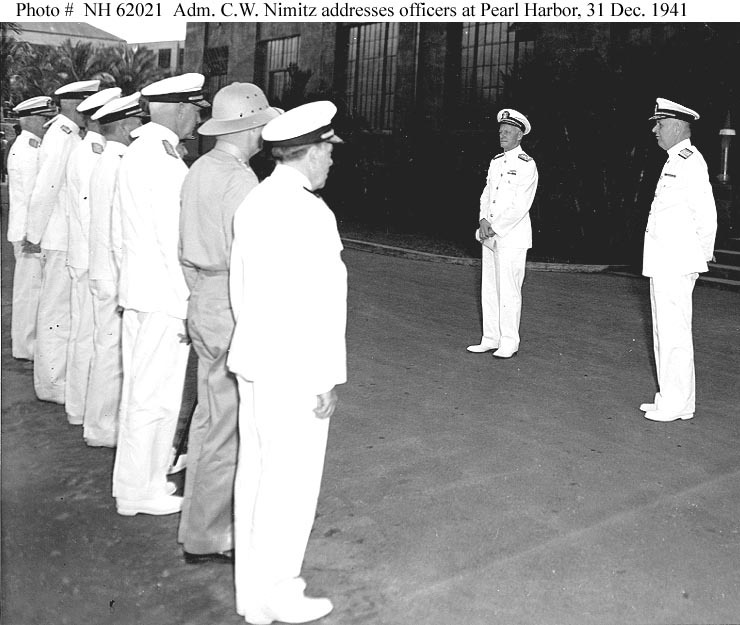 Others receiving awards, standing left-to-right in line behind Nimitz and Fisler, are: Ensign C.F. Gimber, USNR; AMM1c L.H. Wagoner (also awarded the Navy Cross); AMM1c W.B. Watson; R3c H.C. Cupps; R2c W.W. Warlick and AMM2c C.C. Forbes. They were the crew of a Navy bomber. USS Pelias (AS-14) is in the background. 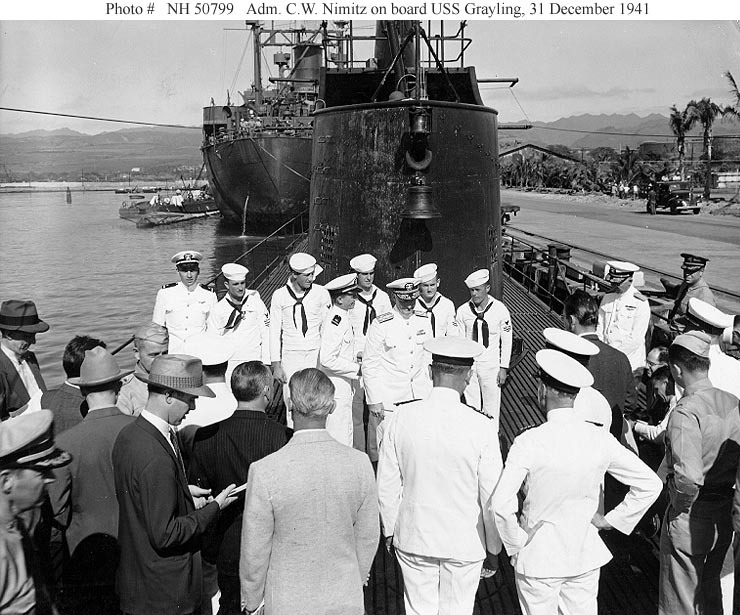 Presenting awards on board USS Grayling (SS-209), at the Pearl Harbor Submarine Base, following ceremonies in which he took command of the U.S. Pacific Fleet, 31 December 1941. 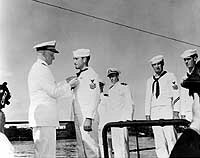 In this view, Admiral Nimitz presents the Navy Cross to Aviation Machinist's Mate First Class L.H. Wagoner. 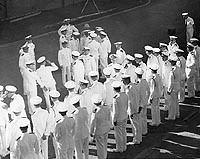 Others receiving awards, standing left-to-right in line from center to right, are: Ensign F.M. Fisler, USNR, largely hidden behind AMM1c Wagoner; Ensign C.F. Gimber; AMM1c W.B. Watson; and R3c H.C. Cupps. They were the crew of a Navy bomber. 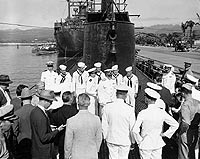 Shakes hands with assembled officers on pierside at the Pearl Harbor Submarine Base, following ceremonies in which he took command of the U.S. Pacific Fleet, 31 December 1941. Senior officers are in the left and left center, conversing and exchanging salutes.